Timber bamboos are among the fastest-growing plants in the world. Well-established groves can produce canes 75 to 100 feet tall and 6 inches in diameter in a single growing season, which may be as short as two months in cold climates. As a landscape plant, timber bamboo can form impressive mini-forests or can be used as a tall screen. The slender canes and thin leaves provide a light and airy atmosphere that is enhanced by the sound of the leaves rustling in gentle winds. Dig a hole at the planting location a few inches deeper and twice as wide as the container the bamboo came in. Back-fill 1 or 2 inches of soil, creating a slight mound in the center of the hole. Remove the timber bamboo from the nursery pot and gently loosen the soil around the edges of the rootball. Place the bamboo in the hole and adjust its position so it stands upright and the ground surface is at the same level as it was in the nursery pot. The roots should flare away from the cane just at and slightly above ground-surface level. Fill in the hole with the same soil that came out of it. Gently firm up the soil so the bamboo can stand up on its own. Water the bamboo thoroughly and let the water soak into the ground. Fill in any holes created by the water settling the soil. Monitor the timber bamboo carefully for the next few seasons. Keep the soil evenly moist, and do not let it dry completely. Fertilize timber bamboo groves that are several years old and well-established with a high-nitrogen granular fertilizer in the spring. Prune out dead and unwanted canes by cutting them off at the ground with a fine-toothed saw after they have matured in the late spring or summer. Only remove up to 1/3 of the live canes per season. Leave fallen leaves on the ground as mulch; the leaves help add nutrients to the soil. Select the appropriate species and variety of timber bamboo for your region. Pay attention to cold-hardiness. Common timber bamboo Phyllostachys bambusoides, can withstand winter temperatures down to 5 degrees, while others such as varieties of P. edulis and P. vivax can withstand minus 5 to 6 degrees. Select a location that is appropriate for large running bamboo. Timber bamboo can reach 50 to 100 feet tall depending on the type, and sends out underground runners up to 30 feet or more that will sprout into new canes and invade nearby landscapes if uncontrolled. Timber bamboo needs evenly moist, well-draining soil with a moderate amount of organic matter. 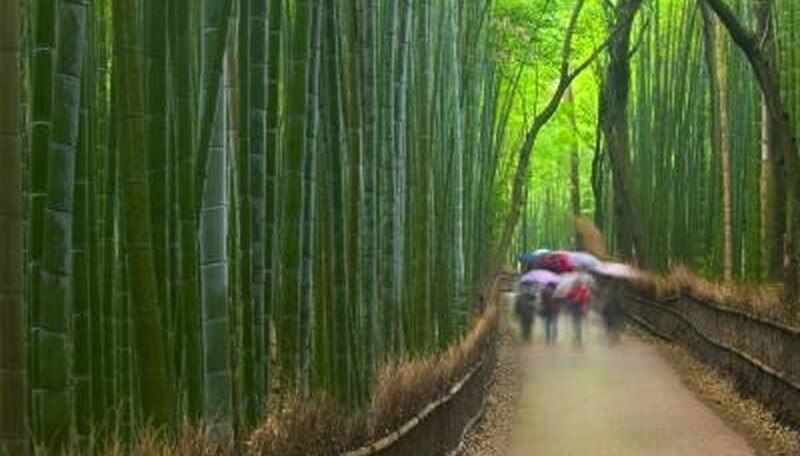 To prevent the bamboo from invading other areas, dig a 3-foot-deep trench all the way around the grove like a moat. Fill it up to just 2 inches below the soil line with gravel, then cover the trench with about 2 inches of dirt. Every season, run a spade along the edge of the trench in the top 2 inches to sever any spreading runners before they root and sprout new canes. Newly planted bamboo can burn in full sun until it has become established. You may need to protect it with some light shade for the first season. American Bamboo Society; Bamboo Glossary/FAQs; How Do I Take Care of My Bamboo?